The WACO GC-4A was used for a wide variety of operations during World War Two. For the American troops, it became the standard glider. The British forces however preferred their own Horsa’s, but used the GC-4A, which was known in the RAF as "Hadrian", for more specific operations, especially those with clandestine purposes. The operational carreer for the GC-4A started in June, 1943, and ended in June 1945. In both air forces, a total of 3650 missions were flown. CG-4A's were often adorned with chalk "nose art". Pictures probably taken during the Normandy or Holland campaign. "Towed Targets", that's what they were... (via Jean-Louis Roba). On June 23, 1943 , a CG-4A nicknamed "Voodoo" (RAF serial number FR579) took off from RCAF Dorval and set course to Goose Bay, Labrador, being towed by an RAF C-47. The purpose of this mission was to fly a glider, loaded with a 3360 lb freight of medical supplies, engine and radio parts in three legs from Canada to Scotland. Also on board were flotation bags tot keep the glider afloat in case of a ditching. On June 27, the combination headed for Bluie West One. Three days later (June 30) the glider was towed over the Atlantic, landing in Iceland after a flight of 7 hours and 15 minutes. The next day the combination took off for the final leg, they landed in Prestwick, Scotland. This was the first time in history a glider was towed over the Atlantic, it took the Voodoo-combination a total of 28 hrs flying time . The glider pilots were the Squadron Leaders R.G. Seys and F.M. Gobeil RCAF. The British General Montgomery decided to use gliders for the assault on the Mediterranean island of Sicily. The gliders were to seize the Ponte Grande bridge. The British Glider Pilot Regiment was equipped with GC-4A’s, but forty-two American pilots were attached to act as instructors for the British pilots. Thirty of them volunteered to take part on the operation as co-pilots – nineteen actually did. 136 GC-4A’s took off from airstrips in Tunisia and were towed towards Sicily. There they met heavy Flak. The gliders were released too far offshore. At least 69 GC-4A’s landed in the sea, drowning 207 men. Another 7 were simply missing. The actual casualty number was much higher, probably over 600. Only three GC-4A’s actually landed in the landing zone. Target for this combined glider-paratrooper operation was to take the Prima Sole bridge over the River Semeta, five miles south of Catania. 8 GC-4A’s took off from an airstrip near Kairouan, Tunesia, accompanied by 11 Horsa’s. Two GC-4A’s had to abort the mission. Three glider towing aircraft (not specified whether these were for GC-4A’s or Horsa’s) were shot down. Not one single GC-4A made it to the target – all were lost. Only four Horsa’s landed near the target. Both GC-4A-operations in Sicily were a failure. 3 GC-4A’s were towed from Bari (Italy) towards the Yugoslavian snow covered woods near Petrovac. On board were thirty senior Soviet officers, led by Marshal Korneyev, who had to make contact with Josip Broz "Tito", the leader of the Yugoslavian partisans. All three RAF Glider pilots made a perfect landing in the snow. The men and loads were pulled away by sleigh. One month later the pilots were picked up by C-47 from the same landing zone. Gliders, stationed in India, had to land in several clearings in the Burmese jungle code-named Piccadily, Broadway, Aberdeen, White City, Blackpool and Chowringhee. 6 GC-4A’s landed with equipment by the River Chindwin to establish a bridgehead to protect the troops crossing. 37 GC-4A’s landed at night at Broadway, delivering 539 troops, three mules and almost 30 tons of supplies. Another 8 had landed in friendly areas and 9 in enemy-held territory. The troops immediately started to construct a runway on which the following night 63 C-47 planes landed. 12 GC-4A’s were dispatched to land at Chowingree. One of these carried a bulldozer, but the glider carrying it crashed. Another 4 GC-4A’s, one carrying a new bulldozer, landed at Chowingree. Only four hours later a new landing strip was created on which C-47 could land. The gliders used for the operation on Chowingree were snatched out. 6 GC-4A’s landed at Aberdeen with bulldozers and equipment to create another dirt strip. The next day, after the C-47’s had landed, all six GC-4A’s were snatched out. White City LZ came under attack and 5 GC-4A’s with ammo landed there during the battle.3 gliders were snatched out with wounded soldiers on board, the other two were destroyed by the Japanese. 1GC-4A landed on a sand bank of the River Irrawaddy with four folding boats on board, enabling the forces present to cross the river. Later that day the GC-4A was snatched out. 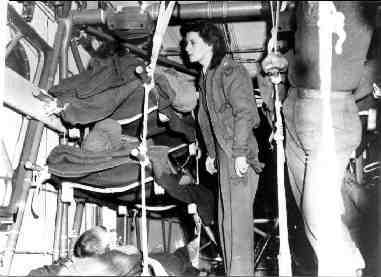 For several weeks an unknown number of gliders were sent to the jungle to resupply the troops and to fly out wounded troops. US and Chinese troops captured the airfield of Mykityina. As they were expecting a Japanese counterattack, 10 GC-4A’s were sent to the field, which landed under heavy fire. 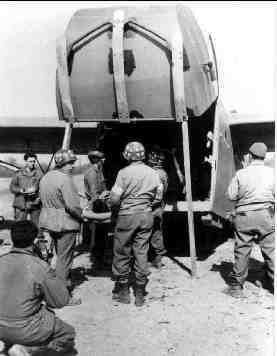 With the help of the native population the equipment was discharged and the strip was prepared to accept larger C-47’s. That same day reinforcement troops arrived by C-47’s. The glider operations in Burma proved that gliders were the superb aircraft to deliver equipment, including bulldozers, to prepare a runway for transport aircraft, deep in hostile territory, far behind enemy lines. It was scheduled to tow 514 gliders, of which 292 GC-4A’s and 222 Horsa’s in six glider operations on D-Day (June 6) and D+1(June 7) near Hiesville (10 miles inland from the Channel coast) and Saint-Mère-Eglise, in order to capture vital points for the invasion of Normandy. 101 AB/434 TCG, 52 GC-4A’s landed at 03.45 hrs. and delivered 155 troops, 16 anti-tank guns, 2 &frac12; tons of ammunition, 25 vehicles and 1 bulldozer. 82 AB/437 TCG, 52 GC-4A’s landed at 04.10 hrs. and delivered 220 troops, 22Jeeps, 18 anti-tank guns, 10 tons of supplies and 5 trailers. (1st wave) : 82 AB landed in two serials, each consisting of 8 GC-4A’s/18 Horsa’s of 434 TCG and 14GC-4A’s/36 Horsa’s of 438 TCG respectively at 21.04 and 21.37 hrs. Both serails carrying 437 troops, 64 vehicles, 13 anti-tank guns and 24 &frac12; tons of supplies. (2nd wave) : 82 AB landed in two serials to supply artillery. In the 1st serial 2 GC-4A’s/48 Horsa’s of 436 TCG were down at 22.55 hrs and delivered 418 troops, 31 jeeps, 26 tons of ammunition and 25 tons of supplies. 12 GC-4A’s/38 Horsa’s of 435 TCG were to land at 23.03 hrs. to deliver 319 troops, 12 howitzers, 28 jeeps, 33 tons of ammo, 23 tons of supplies – each GC-4A carried a howitzer. 82 AB landed in two serials, respectively at 07.01 hrs. (50 GC-4A’s of 434 TCG and 2 Horsa’s) and 07.55 hrs. (32 GC-4A’s and 18 Horsa’s) of 437 TCG carrying of 717 soldiers of the 325th Glider Infantry Regiment and its HQ. Glider soldiers of the 325 GIR and 401 GIR were landed in two serials ; 20 GC-4A’s/30 Horsa’s of 439 TCG landed at 08.51 hrs. with 968 troopers and 50 GC-4A’s of 441 TCG landed at 08.59 hrs. with 363 glidermen. During Operation Hackensack also 17 tons of ammo, 25 vehicles, 10 tons supplies, 18 tons equipment, 5 trailers and 12 mortars were delivered. 436 TCG towed 40 GC-4A’s from the Italian West Coast with half of the 64th Light Artillery Battalion, Royal Artillery, of which 37 landed near La Motte at 09.26 hrs. This operation was in combination with Horsa gliders. 332 GC-4A’s were to be towed by the 442, 438, 439, 440, 441, 62 and 64 TCG in seven serials, each with 10 minutes interval. They flew some 2250 troopers of the 550 GI Battalion, the 596AB Eng. Cy, the 442 Anti-tank Cy, the 834 Chem. Mortar Cy as well as Signals and Medical units. About 95 % of the force made it to the combat area near La Motte and La Mitan. 10 GC-4A’s, piloted by the RAF Glider Pilot Regiment, took off from Tarrant Rushton (Dorset), each carrying a jeep and three fully armed French SAS-men. Their mission was to attack strongpoints held by the Germans. One of the combinations had to give up and returned to base. The other 9 gliders landed at Saint-Hélène – one of them however crashed in the trees, injuring both pilots. A few moments later the Vickers-armed jeeps drove away with all the SAS’ers, accompanied by French maquisards. All the glider pilots were safely evacuated when the Americans arrived in the area. During the Market Garden operation the principal aim was to get the bridges in the area of the Dutch towns Eindhoven, Groesbeek and Arnhem in Allied hands. Meanwhile, an armoured column should leave th north-Belgian town of Turnhout in order to meet the troops along the road Eindhoven-Arnhem. During this operation Market Garden the Allies combined airborne troops with glider forces. Getting the bridges and area around Eindhoven (and the villages Best, Son) was a job for the American 101st Airborne Division. The Eindhoven-force mostly flew the Southern Route, over the Belgian coastal city Knokke, with the inland turning point over Geel, after which they headed north, into Dutch occupied territory. The Nijmegen/Groesbeek area, situated further north, was the target for the 82 AB. 82 AB 61, 313, 316, 434 TCG towing 406 GC-4A’s to LZ-O with 325 GIR, 80th AB Anti tank bn, MP platoon, Recce platoon, two companies engineers. Several CG-4A's landed in Belgium, like "Dorothy", which came down near Kalken (Marcel Janssens). 20 GC-4A’s of the Glider Pilot Regiment were towed from Bari (Italy) to Megara, Greece, each carrying either a jeep or gun and six troops, one carrying a bulldozer. 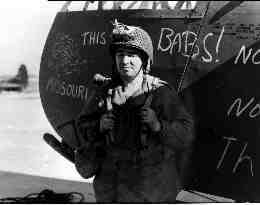 They had to support the airborne troops which had landed there three days before. After a seaborne operation the goal of this whole operation in Greece was obtained : Prime Minister Papandreou’s government was installed. However, a month later a civil war broke out amongst the Greeks. The 20 gliders were snatched out of the airfield, with their British pilots. 4 GC-4A’s landed in New Guinea carrying US Army Engineers with their equipment to construct a landing strip. By December 25 the American forces had taken heavy casualties and were short of medical staff near Bastogne. It was decided to supply Bastogne by air. 1 GC-4A of 96 Sqn, 444 TCG took off from Etain (France) and was towed to Bastogne with a volunteer team of medics. 10 GC-4A’s with 16 tons of ammo and medic personnel flew to the same area. During that flight, 7 medics were killed due to enemy fire. 50 GC-4A’s of the 439 TCG flew with ammo to Bastogne. 15 gliders were shot down by the Germans. The other 35 landed and unloaded the fuel and ammo. Gliders transporting all kinds of elements of the 17 AB, were to land along the Issel Canal (north of Wesel) to secure the bridges. With 798 GC-4A’s participating, this operation was to be the biggest glider operation in history. All the gliders for this operation started from airfields in France. All the gliders to landing zone &laquo; S &raquo; (north of Wesel) were flown in double tow – those to landing zone &laquo; N &raquo; (S of Hamminkeln) in single tow. Camalaniugan airfield, held by the Japanese on the Philippines, was to be captured in a combined operation of gliders and paratroopers. 6 CG-4A’s and one CG-13 (the larger brother of the CG-4A, this was the only combat operation flown by this type) of the 54 TCG landed at the strip, carrying six jeeps, one trailer, ammo, medical ; supplies and radio’s. Later, 3 CG-4A’s were snatched out.